Plaque removal: Plaque is a clear, sticky substance that gradually forms on tooth surfaces, and it’s filled with harmful bacteria that can cause tooth decay and gum disease over time. Thankfully, it can be removed with diligent brushing and flossing at home before it turns into tartar. Our team will be sure clear away any missed areas during your child’s cleaning. Tartar removal: When plaque is allowed to stay on tooth surfaces for too long, it hardens into tartar, which has to be removed professionally. We’ll use special instruments to get rid of this dangerous substance as thoroughly as possible. Stain removal: Any minor dental stains will be buffed away for a squeaky-clean look! 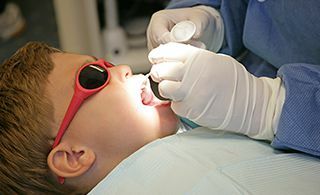 Children of all ages are welcomed at Pediatric Dentistry of Prospect, as well as special needs patients! We love getting to know your loved ones and helping them enjoy the oral health and happiness they deserve. Families from River Bluff, KY and surrounding areas are encouraged to contact us today and schedule a first visit.